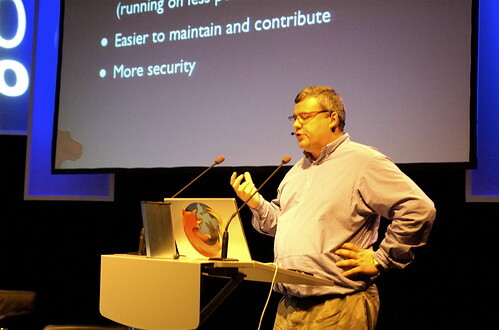 Now up on stage is Tristan Nitot, co-founder of the Mozilla Europe Foundation. Germany is the second biggest market for Mozilla in the world after the US. Poland and Slovenia are approaching 50% of FF users. Although rumours say it, beta 1 is not yet ready. Speaking is Reshma Sohoni about how they come up with the entrepeneurs for their project. It is all about creating, accelerating the next phase of european entrepeneurs. EU as 11 of Top 15 broadband markets (actually 10 as switzerland is not in the EU). Europe has given birth to a lot of technologies: MySQL, Linux, etc. Entrepeneurs are actively investing such as Zennstrom, Samwer etc. Organization supported by leading VCs, Angel investors, Corporates, etc. The go-to community for entrepreneurs starting up Internet and mobile related businesses. Started a few months ago. 4 phases: Application & Selection, Seed funding, Company development, Seedcamp on the road. Ari Virtanen has two devices in his pockets these says. One cellphone and one internet tablet. Tim asks if this is a laptop replacement. It’s a totally different computing behaviour than with a laptop. Now we come to the purchase of NAVTEQ and what Nokia might be in the future. Ari says that devices will be part of Nokia’s future. They will not just go into a different direction. But on top of this Nokia put together a good set of internet services. Services and Devices work together and interact. How is the relationships to carriers as they usually had the services. Is Nokia at odd with the carriers now that they provide freely available internet services? Ari: The services from the carriers are mostly speech based and this area is more or less over and things are shifting. It is not that black and white anymore. Tim thinks in the mobile market Europe has the most to get into Web2.0. Tim then gets back to NAVTEQ and wants to hear more about it. Ari: Nokia has a pretty good situation in the devices but not so good in the services. To extend this such deals are needed. It’s about adding a context and content to existing services. Think of photos etc. and mashups. Tim: Is this a missed opportunity by NAVTEQ because they did not provide user generated content. Will Nokia add this? Ari: Nokia users make up a good chunk of people who create user generated content (think cams). So he sees a lot happening there in the future. Tim: Why do you wanna own that asset? Ari: NAVTEQ is staying very independent inside NOKIA. By having this asset what NAVTEQ provides, there is a lot of potential for NOKIA to combine this with other information such as location contexts. For Ari this defines Web 3.0. Web 3.0 then adds context. 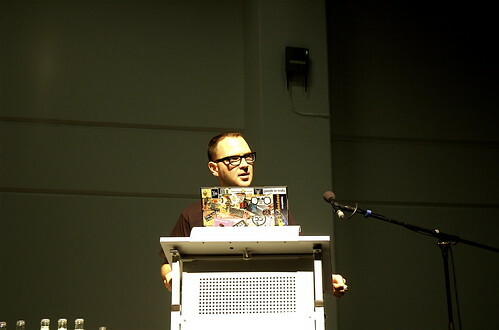 Tim: Usually you see hacker activities first before it gets more mainstream. Ari: Social Networks are one of the fastest growing trends at the moment. Nokia can add location and being able to stay connected all the time and interact with your community (Tim interrupts here..). Tim: In the classes of uses there are already lots of players (photos, music. …). Are you e.g. competing with flickr or picasa? Ari: NOKIA will cooperate not try to replace them. Tim: Think about iTunes, there is a strategy with the PC as the central piece and lots around it. Will it be the same for Nokia? Ari: NOKIA wants to make it as easy to use all those services with your handset. Tim: Now what about the Adressbook, why do we only see the last 10 calls not every call as this is my social network? Ari: This is one of the potential services NOKIA can think of. This kind of presence information can then again combined with your context. The starting point is a trusting ground, a trusted platform which NOKIA has. You need to build on top of that. Tim: Do you see the phone getting into new form factors? Ari: Certainly, see the internet devices and also laptops will change. It’s more a business model change though than a technology change when it goes to the more open internet model (e.g. VoiP). NOKIA will soon have WIMAX on some devices. But this might add a subscription model and they don’t want this on the internet devices. Tim: So what about Google and the GooglePhone rumours? Ari: Google is very much serving the vision Nokia has but slightly different. All in all this is good for the industry as it drives these things. The more companies are supporting these architectures, the better. No answer to whether he thinks Google will succeed. Tim: Is NOKIA moving further and further away from devices? Ari: We do both directions, devices and services. Just launched no device strategy. Tim: How much revenue do bring services to NOKIA? Ari: Depends on the services. So far the services are mostly in test status. Business model on navigation and mapping might be buying city guides or download fees for maps. Tim: Why hasn’t loaction based stuff happened that much from triangulation? Ari: GPS will be NOKIAs strategy. Not all devices will have GPS though due to the wide range of devices. But high end devices will mostly have it. Tim: How fast is the high-end becoming the low-end in mobile (see PCs)? When is the smartphone the norm? Ari: The markets are slightly different. cannot put the finger on an actual number of months or years. Tim: Do the used phone market change that at all? see ebay. Ari: Not a major part of the market because most people want to have a new device as it’s a status device. Audience: Can you give us a NOKIA POV on sustainability, like chargers, packaging, etc. Ari: Good question. NOKIA is thinking about this very seriously. Very soon we will try to standardize these plugs for chargers etc. another q: Why was the plug changed recently? Ari: The new plug is smaller and it’s much better for the device design. They wanted to do it rather sooner than later. Goal is to have a new standard charger for all phones. Question about Media serving. Ari: We have different types of serving media. The most common is one-to-many. But there is another one-to-one serving type. The main problem here is that Europe and the US are playing ping-pong when it comes to copyright directives. If one continent has a longer copyright than the other than it’s extended even a bit more and then again by the other party and so on. All in the name of harmonization. This is not a good thing though. VCR wouldn’t have been possible as Sony once advertised it as not only time-shifting application but also a means for creating your video library. the DMCA also means that anybody simply can take off something the internet without showing prove. no court involved. example: Viacom just searched for keywords which might cover their copyrighted works on Youtube and sent the results to Youtube to take it down. But the search was ambigious and legal stuff was found to but taken down. Viacom also says that privacy should be illegal as it might infringe copyright. But: you cannot share certain pictures anymore as you may not want to have this stuff publically available. Think of your child in the bathtube. there are over 20.000 cases in the US where companies sue music fans. Will this bring them back to the music store? DMCA was designer in 1995 and was shown to Al Gore who dismissed it at first. Now Europe thinks of even worse things. IPRED2 (IP Rights Enforcement Directive 2): Lot’s of scary information behind this link. example pirate bay: A swedish member of parliament asked the police illegally to raid the ISP hosting it. Result: Takedown of 200 more servers not belonging to the PB. The Pirate Bay was not really affected by this though. Businesses had lots of problems due that. If you don’t have backups your business might be sort of dead. CPCM is a far-reaching system of use-restrictions on digital television programming which was suddenly worked on by the DVB group. Every device being able to receive and play digital video will probably need to implement it. CPCM stands for Content Protection Copy Management and is Europe’s broadcast flag but goes much further. As a result US will probably again wants to “harmonize” and make it even worse. So provisions for private audience, classroom showings are not in there. They can simply switch off the broadcast flag and you are not allowed to break it under euopean laws. You cannot show this video although you actually might be legally allowed to do so. Rumour say that you can call a toll free number to override this but how good will this work?!? A video can be flagged that it can only be used by one household. The problem is the definition of “what is a household”. “If you have a boat and a house and another house and a minivan, then this can be treated as one household”. Now imaging: people living in different countries, daughter in a different country etc. They say, it’s a corner case they did not engineer for it. Another example: You and your wife are divorced and your daughter spends half the time at your place and half the time at her mothers’s. Is this a household? Will the 8 year old daughter call the toll free line so she can watch TV? The restrictions of CPCM: A pause button cannot pause a video for more than 2 hours because of some very strange reasons in which cases a show might be able to be seen for 48 hours although it’s only allowed to being watched for 24 hours. Another problem: You are not able to implement this as open source because it could be hacked that way. Interoperability becomes a matter of permission. Since now it is not the matter of the producer to decide what you are allowed to do with something after you bought it. E.g. you can use any charger with your nokia phone. You can only interoperate with that stuff if you make a contract with them. Breaking it is illegal. Now this will get enacted with the new digitial television provisions and then it might get back to the US where maybe the next step is added. Hope can we solve this and make it better? Get involved with the EFF! They do brilliant things. You can support groups in your own country like the CCC in Germany. Participate in the hearings. Right now only the rights holders are there. We need more geeks there. For the majority of music artists giving them more years of copyright makes no difference. Good example in Britain: Resistance stopped prolonging the copyright. All in all a very scary talk and I wish more people had listened to it. Room wasn’t really packed. We just finished a session at the Barcamp Berlin 2 on the new Google Open Social API which is quite hyped at the moment probably due to the name and due to the fact that everybody hopes it fixed the whole social network problem field. Of course it doesn’t but it seems to be a good start. I has the pleasure to present together with David Recordon of Six Apart. That’s esp. nice as I just stumbled upon his paper he did with Brad Fitzpatrick on the Social Graph. David also knows quite a bit more about Open Social of course, simply because Six Apart is one of the Google partners on this project. We also had a great Q&A session afterwards which probably was having more questions that answers. I will try to summarize some of the discussion later (and probably adding my own thoughts). I also recorded part of the discussion on video and I will put this up later and post it here. Unfortunately not too much information on how to implement Open Social containers is available now, otherwise it might be nice to try to create a Plone implementation.